Been on a planetary kick lately. 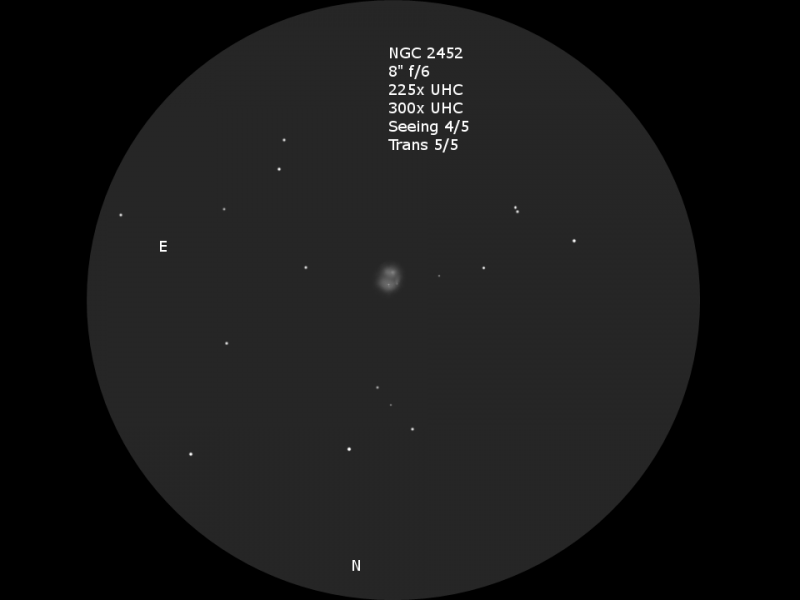 Tonight was a revisit to NGC 2452 because I ran out of things to so after scouring NGC 2207 again. First time I saw it, not really impressed. But, tonight, I just felt like digging in and seeing what's up. It was clear, seeing was good, and transparency is about as good as it get's. 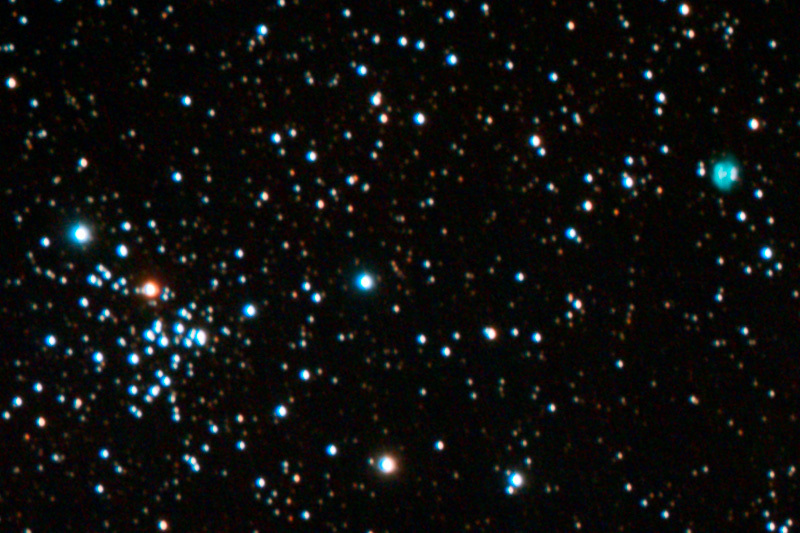 Beautiful cluster, though, NGC 2453...Randolph might be proud I kinda took a liking to it. But, just south was NGC 2452, small and easily seen at low power. So, you know planetaries, you just cannot stay at low power. So, I cranked it up to about 200x then 300x (without a narrow band filter) and well it was kind of there as a bright slightly elliptical fuzzy spot. Kind of hinted at being uneven brightness, but I cannot remember much else at this point. I dropped in the Orion Ultrablock and observed it the rest of the evening. Surprisingly, even at 300x (0.7mm exit pupil) with the narrow band filter, the nebula was still quite visible The sky background, in fact the entire scene was pretty dark. But, that's okay...better dark adaption. And, actually, this time I began to actually see some fleeting detail popping in and out of view. I could see some brightening in the north and south and a weak and not often seen dark bifurcation running roughly east to west. At times it looked split in two, at other times it kind of looked like a hole in the center...almost annular appearance. There were times when would see a brief sparkling in the north and in the south and sometimes in the east. At other times I see a broad lobe north and south. The western edge appeared to be a little broken, in other words the annular appearance was not complete. The eastern side appeared to be continuous and consistent with the annular appearance. So, I could not decide if I was seeing sparkling or a lobe. Then it dawned on me to stop worrying about it, I was probably seeing both. I will tell you, though, the sparkles (often seen individually, and sometimes in pairs) appeared to be closer to the central darkening. So not only where there lobes north and south, but each lobe had an embedded bright spot. At one time I thought I might be seeing a central star, but I am pretty sure it does not have one. But, according to some research, what it does appear to have is some foreground stars overlaying the nebula, and the southern lobe does seem to have at least one (maybe more) brighter lobes. I saw only one that I can tell. So, my guess is that is what I was seeing. I forgot to mention, I stepped down to 200x with the Ultrablock and had a good view. But, I wanted more image scale, so I hit 225x with the filter and stayed at that magnification for a long time, too. I think 225x was most productive. I mean, I saw all of this at 300x, too, but it just seemed better behaved at 225x. The sketch is based on views from all magnifications employed over the hour or so I spent on it. Sure is a far cry from the previous less impressive encounter with NGC 2452. This time I made something of it. Here's one image that kind of resembles what I saw. At the end of every observation, I always recap the detail so I can say I know what (I think) it looks like. But, tomorrow gotta revise my NGC 2207 observation. Had a better view of it tonight. Edited by Asbytec, 11 February 2019 - 12:49 PM. Very, very nice sketch! Looks like an interesting little planetary. Very nice sketch. This looks like a very tough target. NGC 2452 is a very complex PN, with two lobes themselves complex. It needs high power to be explored. 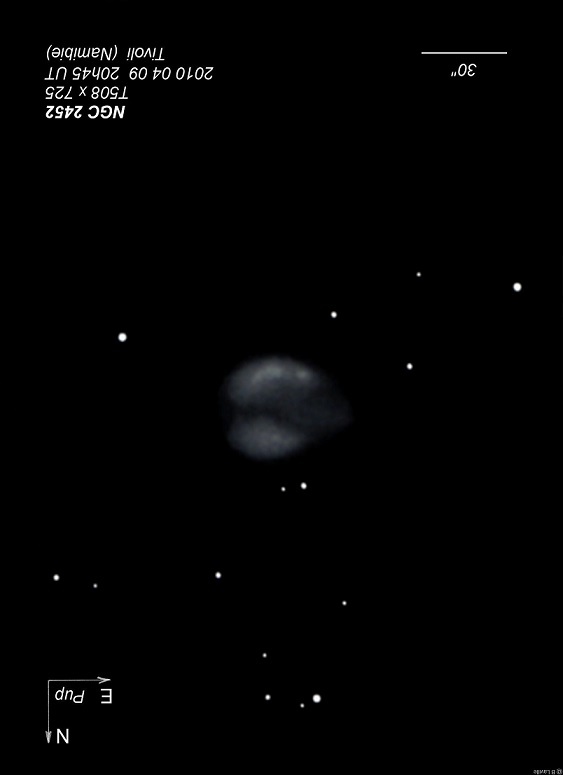 Here is what I saw, in very good Namibian sky, a 20" dobson Obsession, and 726x. I confirm that no CS* can be seen. Thomas, at first look, it really didn't appear remarkable, I'm glad I hit it again almost as an afterthought. If you come back and tell me how beautiful it is in your small quality refractor, I'm gonna buy one, too. Frank, it was a bit of a tough nut to crack, Thank you. It really needs resolution and higher magnification to see it more clearly. For some reason I do not have aperture fever yet. I think I just appreciate what the 8" can deliver. Raul, I ran across your sketch and noted you say variation in brightness, as well, and what looks like a central hole. I saw that appearance of a hole, too, but also the lack of a continuous annular appearance to the west looking (at times) more like a cut of darkness stretching across part of the nebula. Well done. Bertrand, I also ran across our sketch (flipped below and shrunk a little). I had no hope of seeing all the detail you saw with such clarity. Rather the detail was present, but generally much less resolved and probably harder to see. I used your sketch to orient myself and confirm some of the bright areas I saw. Your image is reversed from mine, east is to the right and north is down. What's interesting is, you sketched clearly the dark lane cutting across it along with that bit of nebula jutting out on the eastern edge. I could not see it that well, but I think that eastern nebula just appeared a little brighter than the western edge (as you show a gap in the nebula). That's the best I could do in a smaller aperture. Yes, no central star...except that it either has some foreground stars or some brighter regions that resemble stars. You show some of them. At my magnification and resolution, those bright areas appeared much closer to the center, /almost/ like a central star. If it were not for the fact it had opposing bright condensations in each lobe, one of the bright condensations might be mistaken for a central star at relatively low magnification compared to your sketch. There is a (very?) dim foreground star near the center, though. I do not believe I saw it. My skies are fairly dark approaching 21 MPSAS, and a filter helped somewhat. It did not appear to POP as much as other planetaries, but the view was improved. When I look at your sketch, I recall having some indications of some bright arcs, too. 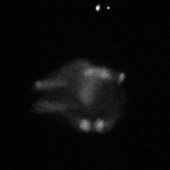 But, I could not resolve it well enough and it really looked more like opposing lobes with embedded star like condensations at my lower resolution. I just figured any hint of a brighter arc or two were just times I could not see the lobes that well. Here's a sketch with a large aperture that is very similar to yours. It shows some detail that can be seen in smaller apertures, but with much less clarity, resolution, and magnification. Below is a sketch and an image more similar to my view. Here is an image that shows some foreground stars and one that is dangerously close to the center of the nebula. I do not know if I saw those stars or bright knots in the lobe. Both or either appeared star like at my magnification. (It's upside down compared to my view). Edited by Asbytec, 11 February 2019 - 07:56 PM. 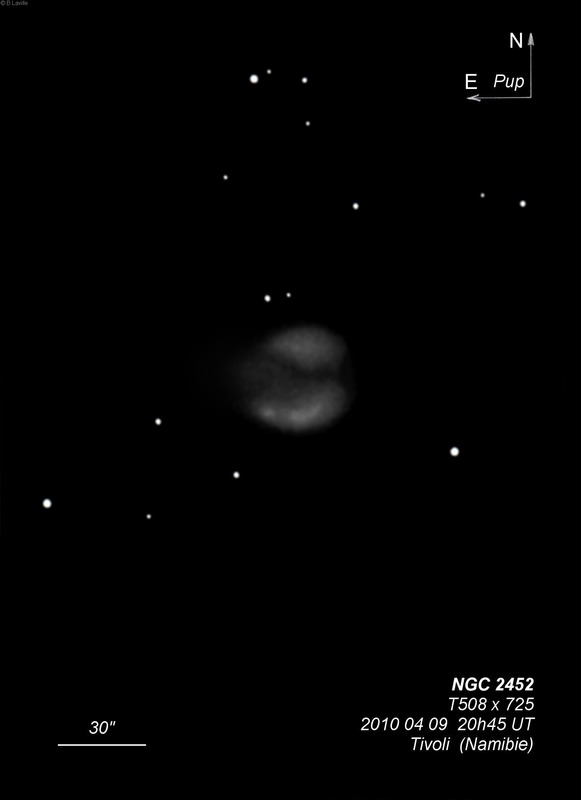 Very good sketch of NGC 2452 . Another one I never heard of low for my declination limits. Most compelling piece here I referenced in online images here is that detached swab of light . Unusual for the common planetary look that's always seemingly more cohesive and tidy. That little but though makes all the difference in terms of intrigue. The central star is rated at 19.5v so no one's going to see it anytime soon. Gosh thats FAINT! Those dull specular-like gleams peering through the haze (Skiff calls "stellarings") would appear to be the parts where there are peak brightnesses emerging. NGC3242 and 7662 offered those for me . It's one of observings more compelling finds yes? M97 I agree really sings with a UHC. Im really glad you are seeing the benefit of the Ultrablock. Especially here where 97s generous size allows a more moderate power. Brings out it's softer edges more defined and boosts the whole enterprise. ItIIS laone tof my favfplanetary. Low surface brightness but what a fine serving. My view with the C6 , with nebula at it's near zenith point and great transparency beat the smack out if the town view through the 8!!!. If I recallI was around 200x and its face squirmed with uneven light. That in itself was wild. Then an eye poked out immediately returning back into the chaotic squirm. Then, the OTHER eye poked out and returned into the maelstrom. Though my drawing shows them together peering back at me, it's a composite after all. I never saw both at the same time! With my 8" view man o' man did I try, again and again and that owls face never opened an eyelid. It was asleep! Here optimum power was 120x with the 8 or it'd disolve into the light pollution. I waited for details here using a UHC, then an OIII. It never twitched. Either you've got a dark enough sky or you don't and in town was not the ticket. Last time I gandered 108 was with my Celestron "Classic" C8 and even casually then, wow... mag 5.5 skys 25 years ago lol, It was immediately apparent this object was uneven. It's actually LOWER surface brightness than 97 but it had condensations in it. Edited by azure1961p, 13 February 2019 - 06:09 AM. Pete, where do you get info on the central star of NGC 2452? It looks dim in images. Yes, stellaring...interesting thing. Are you aware of any theory behind it? Been thinking about it, either it's a star or star-like detail that might conform to some amount of seeing or atmospheric lensing effect. That seems to account for how fleeting and randomly they appear. I'm thinking something like this, look at Bertrand's image above. He does not show a bright spot in the northern nebula. I mean, not really. A little bit. But, I saw a clear stellaring there. 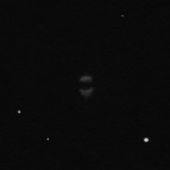 If it's not a dim star as shown in the digital image posted above, then it almost has to be something else. Maybe a brighter lobe that is "unresolved" in my aperture so it simply appears like a bright star-like spot. In Bertrand's sketch, the northern lobe is much better resolved and more extended. In this case, it does not lend itself for the same lensing effect of a much smaller image of a brighter detail I get at lower magnification...like more like a star than a extended lobe. At his higher magnification, that lobe is well extended and will not be condensed into a point source.My contention is, something is likely there to cause the sighting...it's a catalyst for the lensing effect of the atmosphere. If it were just a plain Jane swath of faint nebula, we'd probably not see any lensing effect even though it may be happening. Just a guess as to why that happens. Some folks may say it's an illusion, I am very sure it's not imaginary. But, it may not really be an illusion, either. If it were, one might expect they occur more or less randomly across a nebula...probably all dim nebula. They do appear at random intervals, but usually very near the same place. I do not think I see them randomly spaced across a nebula. If we did, every nebula should come alive with random "sparkling". We just do not see sparkling nebula all over the sky. Most sparkles or stellarings I experience are more or less consistent. Usually you can find a bright knot or a star in that location. Edit: the thing that gets me is, if you take Bertrand's image and send it 3x as far away to approximate my magnification, I cannot help but think his well resolved sketch would look similar to my lesser resolved sketch. It is the same object, after all, it should look roughly the same to within the limits of the aperture to magnify and resolve and our visual perception. He was at 0.7mm exit pupil (good man!) as I was at least for part of the observation. Then I backed down to 0.9mm, it was a little easier on the eye. Edited by Asbytec, 13 February 2019 - 08:31 AM. A stellaring (As I understand it) is nothing more than the beginning of a resolved detail within a nebulous object. Like with 7662, there are these brighter segments that arc with the ellipse of the ring. With the C6 I could not see the arc but I COULD see the brightest point of that arc gleaming by itself. The rest of the arc just layed flat because it was too low in contrast. The single brightest point was the stellaring I saw. Same with M51 with it's brights star forming regions in the brighter arm. There's actually a complex of star forming regions in that crook of the arm but only one was bright enough to show above the low contrast of the Galaxy's main arm. Kind of like seeing only the tip of an iceberg because the rest is masked by the sea. If I could grow my aperture as I observed a stellaring in NGC7662 the lone star-like point of contrast would intensify and finally broaden into an arc , and finally an arc of many points of different contrasts. With a stellaring though we only get the tip of the iceberg. It's a great thing to behold it though eh? Yes. Okay, we're on the same sheet of music. You said it better. What's interesting here Norme is that if or when a stellaring emerges it's as though contrast has crossed a threshold. Either for example you see a smooth grey ring of light OR you see a brighter point-like contrast coming through. You don't see a gradient coming to a peak brightness, just the discrete stellar-like shine . And to see the difference in the rest of the ring versus the stellaring, you could ASSUME there's gotta be some contrast values in between those two levels but the courseness of the rods merely register a smooth ring or one with a discrete stellaring or two. My belief is, if our rods were as refined as our cones and still had their inherent light sensitivity, you'd then see more of a gentle gradient rising to a stellaring. Not to say a stellaring is not part of a gradient all by itself, it is of course but it's a very limited iceberg tip. I like the objects you've been hitting.